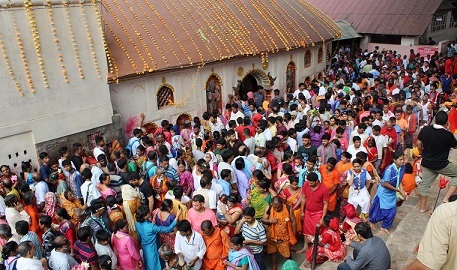 Ambubachi Mela, the largest religious congregation of the region that began on June 22, witnessed around over 19 lakh footfalls till Tuesday, the last day of the religious festival at Kamakhya Temple in Guwahati. Assam Tourism Development Corporation (ATDC) chairman Jayanta Malla Baruah expressed happiness at the flow of pilgrims in this year’s Ambubachi Mela during his visit to Kamakhya Temple. Assam Governor Jagdish Mukhi, Chief Minister Sarbananda Sonowal, Assam Pradesh Congress Committee president Ripun Bora and many other political leaders and bureaucrats also visited the temple early in the morning. Lakhs of devotees thronged the Kamakhya Temple on the occasion ofnibritiof Ambubachi on Tuesday. The door of the temple was closed at 9:27:54 pm on June 22. Pilgrims from within the state and outside were seen making beeline from early morning seeking blessings of Goddess Kamakhya. As per official report, around 1.64 lakh devotees visited the temple till 2 pm on Tuesday. The Ambubachi Mela was inaugurated on June 21 by Assam chief minister Sarbananda Sonowal during a programme at Sonaram Higher Secondary School playground in Guwahati.